Stop blaming your body. Start listening to it. We often blame our bodies for what we perceive as faults, especially when it comes to food. Stupid stomach. Why are you cramping? Ugh, I’m hungry again. But I just ate! I am so bloated. I wish my intestines would just cooperate. This is so inconvenient. I feel like I can’t stop eating. What’s wrong with me? I have no self control. And it is sending you signals that only you can read, but you have to tune in and listen closely. You have to know how to decipher them. We all intuitively know it’s not only what you eat that matters, but how you eat. Yet, nearly every diet out there has some sort of program or instruction manual or meal plan that aims to teach you how to eat, but in the process, actually teaches you how NOT to eat. Because most diets instruct you to eat certain foods at certain times in certain amounts. Unfortunately, this way of eating undermines your body’s natural cues and sets you up for yo-yo dieting. 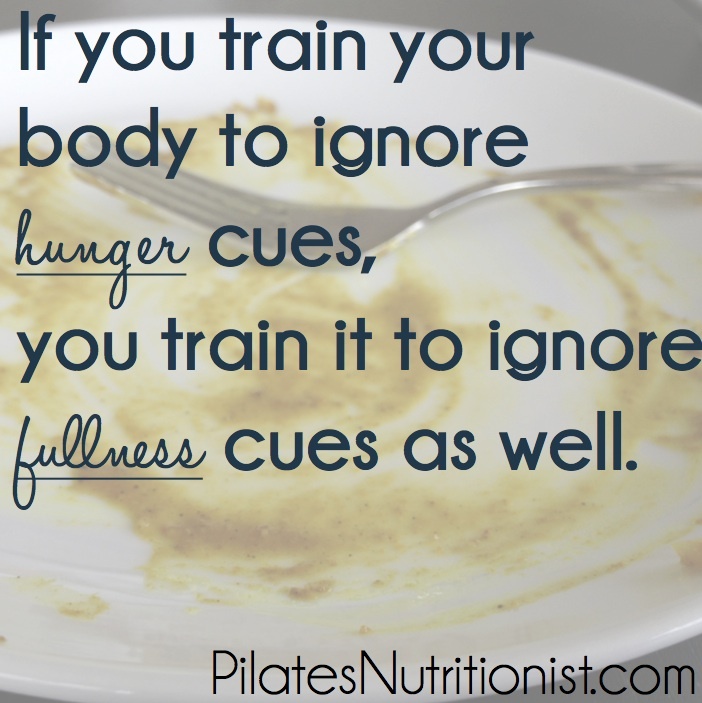 If you train your body to ignore hunger cues, you train it to ignore fullness cues as well. <– If you like this, share the love on Pinterest. Still hungry? Too bad. Extra food isn’t allowed on your meal plan. Not ready for a snack yet? Too bad. Your diet told you to eat a snack 2 hours after your meal, so you better follow the rules and eat. Don’t want rice cakes? Too bad, that’s your 3pm snack. Deal with it. Want chocolate? Too bad. You can’t have any sugar. This is a disaster for your metabolism and your psyche. This is why after giving up on yet another unsatisfying diet, most people regain the weight (plus some). It’s as if every cell in your body is starving and begging you to eat. If you give in, you feel bad. If you don’t give in, you feel deprived. Eventually, you will eat again. And so the cycle continues… unless you change the way you’re approaching food. How to stop the cycle and enjoy food again. What is on your mind other than food? Are there any sensations in your gut at this very moment? Identify the signals without judgement and without shame. Just give it a name. Maybe it’s “really hungry, need food NOW” or “only a little room in my stomach” or “almost full” or “uncomfortable” or “I’m feeling shaky”. These are not good or bad, they are simply sensations or feelings. Once you give it a name, you can make a choice on how to handle it. But if you ignore the signals or judge them as they come in, you are telling your body that it doesn’t know what it’s doing. You train your body to believe that it’s faulty, that its opinions don’t count, that food has control over you, not the other way around. Now that you’ve identified the sensation(s) in your body, you decide what to do with it. You make the choice to start or stop or continue eating, not the food. You decide what to eat. You decide to savor each bite. You decide if you like the flavors. You decide when you’ve had enough. Well, for many people it’s not. This takes continual practice and a willingness to see and listen to your body just the way it is. And it’s just one of many mindful eating exercises that I use with my clients. Stop blaming your body. Start listening to it! We know diets don’t work. We know restriction doesn’t work. We know the results are temporary. 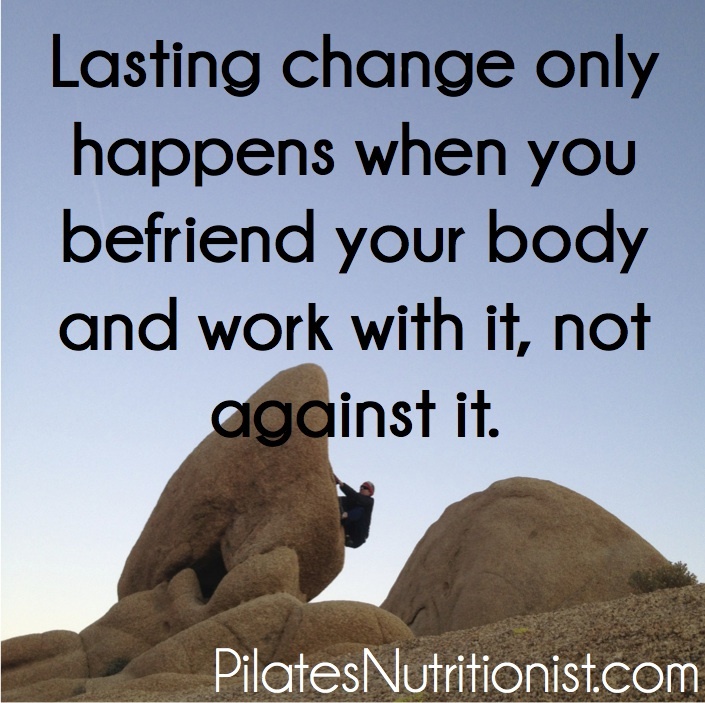 Lasting change only happens when you befriend your body and work with it, not against it. Imagine a way of eating that allows you to eat your favorite foods, even the occasional junk foods, and not gain weight. Guess what? You can live that reality. People who focus on mindful eating lose weight and keep it off, all while enjoying eating good food. The longer you practice, the more your body will start craving the food it needs to be healthy, while still allowing room for treats. Do you find yourself judging your body’s signals, such as getting annoyed when your body is hungry? If so, how do you react? I have been counting calories for a long time, and during that time I have gained and lost the same 7-10 pounds over and over. A few days ago I found this site and decided to give this a try – eating only when I’m hungry, and stopping when I’m satisfied. I have noticed that I’m very rarely “hungry” as you define it above, and when I do become hungry, I can eat a very small portion and be satisfied for a long time. Could my hunger cues be masked by other things? Is it safe to eat very little if you’re listening to your body? First off – way to go for trusting your body and trying another approach! That already is a huge step. It takes a while to re-learn how to listen to your body when you haven’t practiced it, so I wouldn’t overthink it too much in the beginning. This post, “How to Know if You’re Truly Hungry,” might give you some additional guidance on mindful eating and hunger awareness. It’s 100% normal to find this a challenge in the beginning. Thank you for this helpful article. I’ve battled my weight since elementary school. I’ve practiced purging, excessive fasting, calorie counting, program diets, and binge eating and they all led me here. Nothing will work if I don’t learn to trust myself. I’m so scared to begin this new journey. I’m scared I’ll end up gaining even more weight. But I’m going to try and I’m going to listen. I know I eat a lot out of anxiety so I’m going to have to listen for that and find another way to cope. Anyways, thank you for writing this.